Got the feeling not a lot of you had seen this one, but if not, please let this be a spur to check it out. The new season, I’m happy to report, is brilliant and it’s easy to get caught up on Netflix. Hey Matt, I can't wait to check this one out. I'm writing like crazy lately. I made my own crash course with your book this summer and I'm firing away at some old stories. This week I've ramped up my outlining skills using my version of your structure section. I outlined maybe 20 plot points for one character. Unsatisfied, I outlined another 20 plot points for a different charcter. I think the second character has stepped forward as the hero. Sounds like you're doing great work! Power through that thing. Enjoying your coverage of this—I was only 60% convinced after watching the first three eps but I’ll make a point to check out the rest now. One thing I was wondering re: the very high concept being a hard sell—might this have been different had it been pitched as a cartoon? Obviously our expectations are different for animation, and I feel I’d allow it that much more benefit of the doubt. The good news these days is that effects have gotten cheaper and TV budgets have gotten bigger so you can write the sort of stuff into a live action pilot that would have necessitated that it be an animated pilot in the past. This could have gone either way, but I think it works better live action. 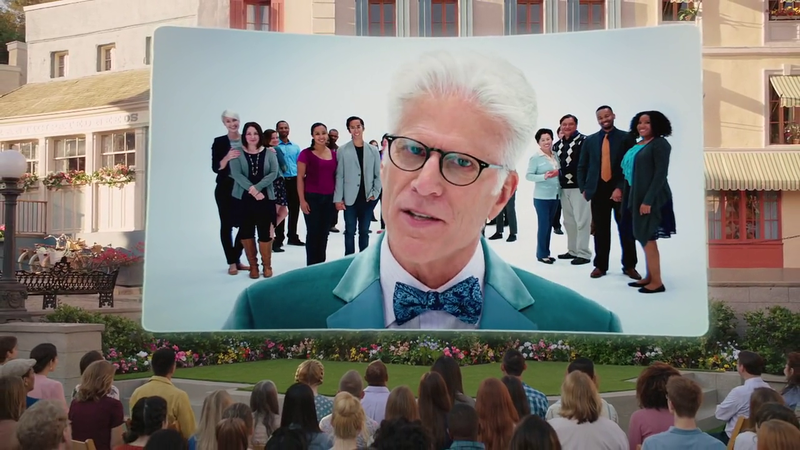 One of the genius aspects of The Good Place is that it depends upon the fact that the audience understands it to be a sitcom. In a sitcom, of course the worst possible thing is going to happen on a regular basis; of course the characters are miserable despite opulence and abundance; of course their plans will blow up in their faces, everyone's rude to one another, and feelings are hurt all the time. It's a sitcom! Without that genre awareness, the audience would have twigged to the truth very early on. Also, how much of a brilliant gag is it that the show set itself up as No Exit: the Series but then breaks that play's eternal stasis immediately and chews through plot at a mind-blowing pace. This show burns through a premise in a single episode that would last an entire season on a traditional sitcom. And it does it every dang week. "No Exit?" Eat it, Jean-Paul Sartre. It's the greatest, the "smartest dumbest show on television." To my mind, "The Good Place" has been the best comedy on TV the past three years, precisely because the audience is in on the joke. Season 1 was mind-blowingly funny with its wholly original high-concept conceit. Season 2 (spoiler alert) was darker with its jarring and unexpected twist that cast Ted Danson as an agent of evil. Season 3 is back to the lighter touch of Season 1 with Ted back as an ally of the foursome. While it has the high wit of predecessors such as "Frasier," the show keeps it surreal and isn't too full of itself. I think the only thing keeping it from the pantheon of all-time great comedies such as "Friends" or "Cheers" is that the emotional component isn't as deep -- at least for me. I like the cast of characters, but mostly because they're entertaining, not because I can relate to any of them.